and promises more to come. He is nicely using a Github repo for the development of the guides and you can monitor that repo to see what is in development. Documentation and training are always critical elements of helping people get started with a new language, so it’s great to see initiatives like this one. I’m definitely watching the Github repo and have been reading through his guides already. Thanks, Felix, for putting these docs online! 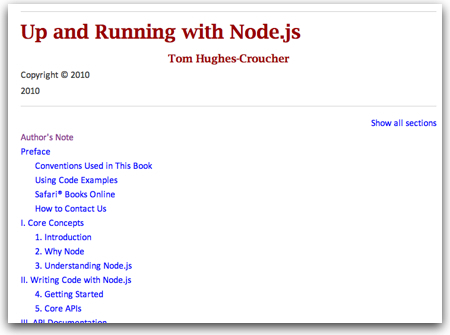 This entry was posted in Node.js, Tutorials and tagged Node.js, Reference, tutorials on March 31, 2011 by Dan York. Node.js certainly has been getting a good bit of buzz these days. I’ve been writing about Node.js here because I personally find it interesting, but you only have to watch the Twitter search string to know that a lot of other people out there find the same fascination with Node.js. 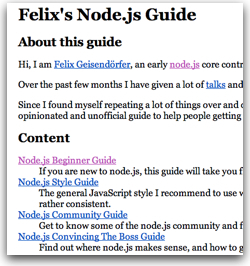 Very cool to see… and may it only help grow the pool of Node.js developers out there! 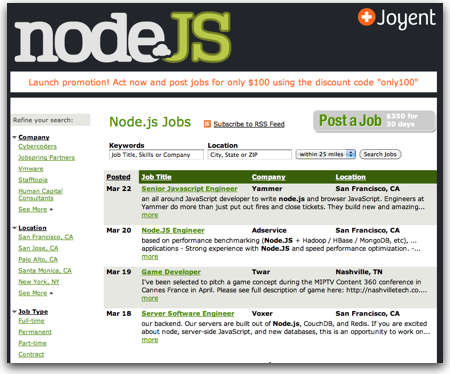 This entry was posted in Node.js and tagged Node.js on March 24, 2011 by Dan York. This server has received 5726804 hits from both ipv4 and ipv6.